Matt Kidd bowling for Bourne against Sleaford. Photo: Tim Wilson. Market Deeping were a couple of wickets away from shooting clear at the top of the Lincs Premier Division yesterday (May 14). 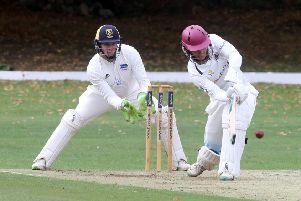 Indeed if visiting Woodhall Spa professional Prasanna Jayawardene hadn’t been dropped twice early on in his innings of 56, Deeping could well have been celebrating a third win of the season. Dave Gillett top scored for Market Deeping against Woodhall Spa. Instead the former Sri Lankan Test player held his side together in the face of excellent precision bowling from left-arm seamer Lee Peacock and spin twins Zac Simmonds and Meli Adatia, the only bowlers used by skipper Dave Gillett. Their efforts helped Deeping defend their own modest 50-over score of 193-9. Woodhall eventually closed on 165-8 with Peacock (3-52), Simmonds (3-68) and Adatia (1-38 from 16 overs) all bowling tightly. Gillett (45) top scored for Deeping who had been reduced to 81-7. Market Deeping share top spot with Grantham, just three points ahead of Sleaford who had much the better of a draw with Bourne at the Abbey Lawns. Sleaford’s new South African import Obus Pienaar cracked 101 to help push his side up to 258-8. That final total represented something of a fightback from Bourne as Sleaford reached 167-1 with 15 overs to go. Tom Dixon (4-69) and Ben Collins (3-76) checked the visitors’ progress. Bourne lost two early wickets and were always up against it in reply. Wicket-keeper Carl Wilson (50), opener Ben Stroud (45) and captain Pete Morgan (44) all scored well, but last pair Collins and Colin Cheer had to survive the final three overs to secure some draw points. Bourne closed on 197-9 and are fifth in the table, but just eight points behind the leaders. *Bourne teenager Sam Evison cracked an unbeaten 202 for Stamford School against Haileybury yesterday. Sleaford 258-8 (O. Pienaar 101, M. Mountain 77, T. Dixon 4-69, B. Collins 3-76). Bourne 197-9 (C. Wilson 50, B. Stroud 45, P. Morgan 44, A. Youles 4-44). Market Deeping 193-9 (D. Gillett 45, D. Bendon 25, Z. Simmonds 20, C. Parson 6-81). Woodhall Spa 165-8 (P. Jayawardene 56, L. Peacock 3-52, Z. Simmonds 3-68).